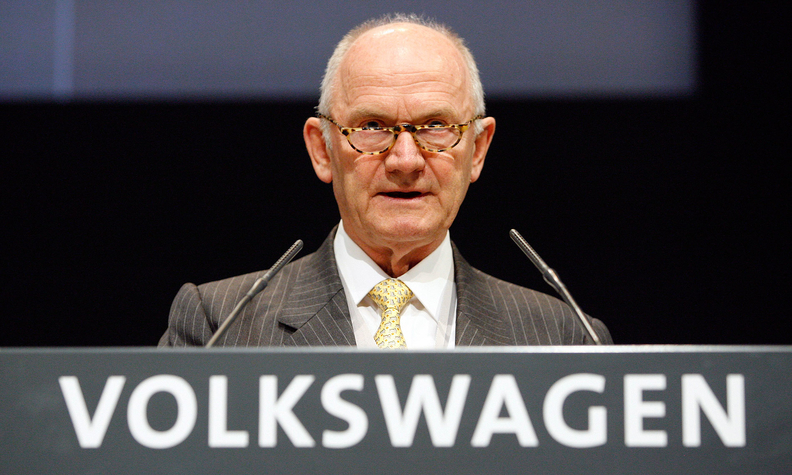 Ferdinand Piech, supervisory board chairman of Volkswagen Group, at the company's annual shareholder meeting in Hamburg, Germany, in April 2008. Ferdinand Piech and Wolfgang Porsche could hardly be more different. Piech is a wiry and driven engineer who has dedicated his life to automobiles. The soft-spoken Porsche, by contrast, seems more comfortable stalking deer in the forest than corporate prey in the boardroom. What has long bound the billionaire cousins together is their grandfather's legacy: their family's namesake automaker, and for the past decade control of Volkswagen Group. Their uneasy association is poised to come to an end. On Friday, Porsche Automobil Holding SE, the family investment vehicle, said Piech is in talks to sell "the major part" of his stake -- valued at roughly $1.2 billion (1.1 billion euros) -- to other family members. Piech owns about 15 percent of the common stock of Porsche Holding, which in turn holds 52 percent of VW's voting shares. To no small degree, the fortunes of the two iconic German car brands have turned on the relationship between the two cousins. Piech, 79, had become increasingly isolated after alleging that Porsche, 73, and other VW supervisory board leaders may have known about Volkswagen's widespread emissions violations earlier than previously acknowledged. In September 2015, VW admitted that it had rigged 11 million diesel engines to skirt pollution controls, a scandal that has cost the company $24 billion in fines and associated costs. The allegations, rejected by investigators as "implausible," prompted some family members to seek to eject Piech from Porsche Holding's supervisory board, people familiar with the situation said earlier this week. Negotiations over the stock sale are ongoing, and there's no assurance of an agreement, according to Porsche Holding's statement. The move to sell is vintage Piech: He takes an uncompromising approach to conflict, and he has usually come out on top. Until recently, Piech was the family's undisputed patriarch, calling the shots first as Volkswagen CEO and later as its all-powerful chairman. His hold only crumbled in 2015 when Wolfgang Porsche and other members of the board threw their weight behind the VW CEO, Martin Winterkorn, with whom Piech had fallen out. 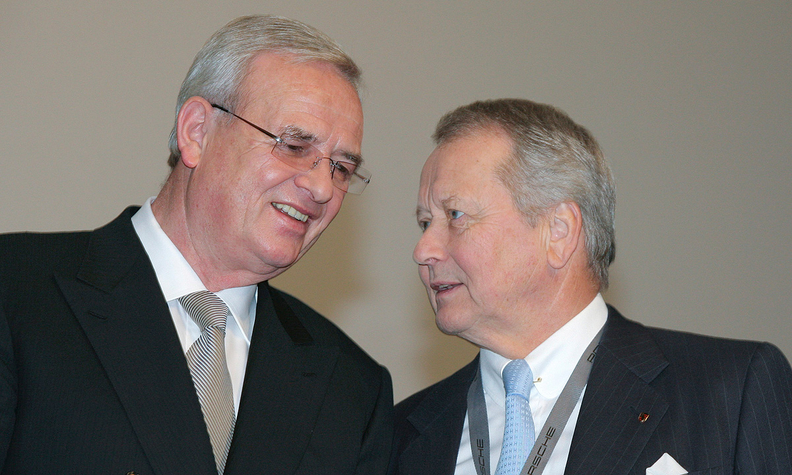 Former Volkswagen CEO Martin Winterkorn, left, once received backing from Wolfgang Porsche, right, a key member of VW's supervisory board and chairman of Porsche. It was a rare defeat for Piech, who quit shortly thereafter. As Volkswagen descended into the diesel scandal, Piech remained silent until the recent allegations of complicity in the cheating. That broke whatever bond remained between the cousins. At the Geneva auto show last week, Wolfgang Porsche offered a rare public rebuttal, accusing Piech of "destroying his own lifetime achievement" with the unsubstantiated allegations. That achievement was created in a lifelong commitment to the auto industry. As other family members pursued careers in other domains, Ferdinand Piech made a name for himself through Audi, where he is credited with spearheading the Quattro four-wheel drive technology and focusing the brand around its engineering prowess, including the use of lighter materials like aluminum. He later took over the top job at VW, building up the carmaker through a series of acquisitions that added brands like Scania heavy trucks and Bugatti high-performance cars to its stable. As a manager, Piech was detail-obsessed and ruthless, orchestrating the ouster of numerous executives. Wolfgang Porsche, by contrast, stayed at arm's length at the namesake brand, making no notable mark on Porsche's direction or products. Still, his connection with the company runs deep. As the financial crisis devastated markets worldwide, Porsche Holding in 2009 was forced to abandon a bid it had made to take over Volkswagen. The German company then turned around and swallowed Porsche. The defeat left Wolfgang Porsche in tears. After losing the bid, he addressed workers in a trembling voice, flanked by the managers who had sought to orchestrate the audacious coup. They did, though, walk away with a mighty consolation prize: The family became VW's biggest shareholder. With Friday's announcement, Piech is set to finally cash in the last of the chips he wagered in that confrontation.